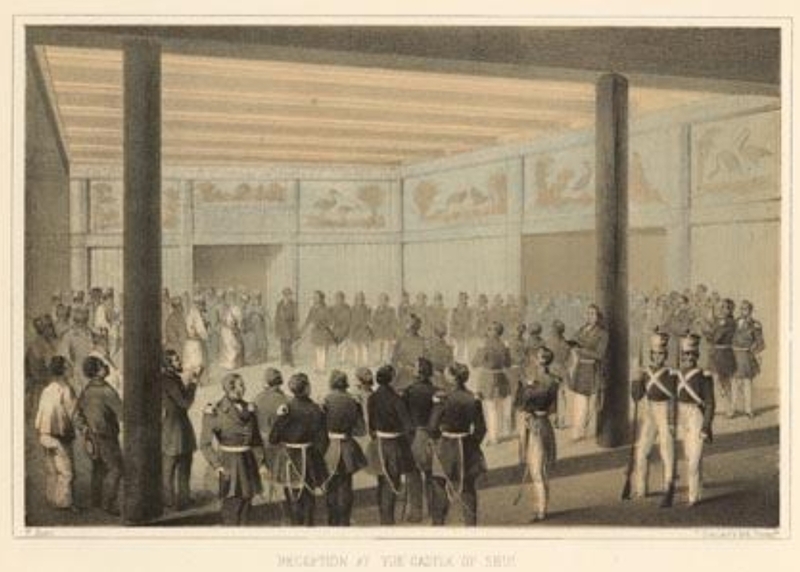 The text of the compact below is from J. Willett Spalding’s The Japan Expedition: Japan and Around the World: An Account of Three Visits to the Japanese Empire, Redfield, New York, 1855: 339-341 [https://archive.org/details/japanexpedition00spalgoog]. Spalding served aboard the expedition flagship, USS Mississippi, a steam-driven paddle frigate. Commodore Matthew Perry headed the expedition. 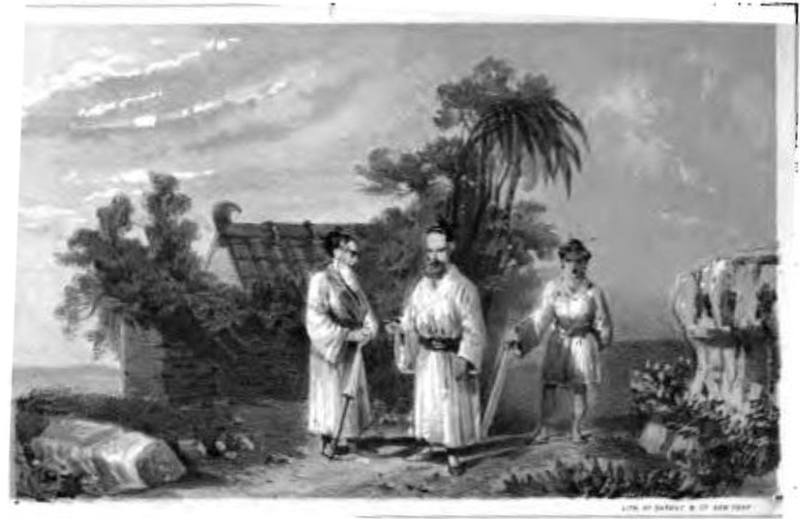 Loo-Chooans, from The Japan Expedition, page 113. Compact between the United States and the Kingdom of Loo-Choo, Signed at Napa, Great Loo-Choo, the llth day of July, 1854. Hereafter, whenever citizens of the United States come to Loo-Choo, they shall be treated with great courtesy and friendship. Whatever articles these persons ask for, whether from the officers or people, which the country can furnish, shall be sold to them; nor shall the authorities interpose any prohibitory regulations to the people selling; and whatever either party may wish to buy, shall be exchanged at reasonable prices. 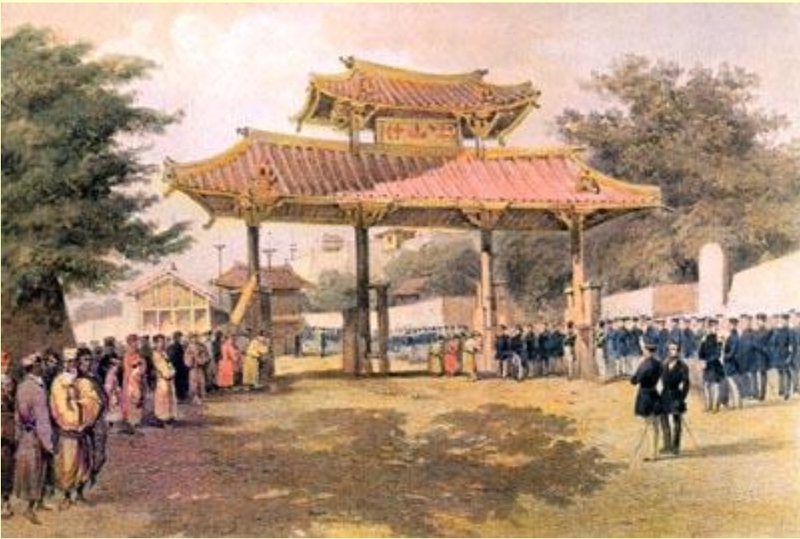 Perry at Shureimon, the entrance to Shuri Castle, June 6, 1853. Whenever ships of the United States shall come into any harbor in Loo-Choo, they shall be supplied with wood and water at reasonable prices; but if they wish to get other articles, they shall be purchasable only at Napa. Reception for Commodore Perry at Shuri castle. If ships of the United States are wrecked on Great Loo-Choo, or on islands under the jurisdiction of the royal government of Loo-Choo, the local authorities shall despatch persons to assist in saving life and property, and preserve what can be brought ashore till the ships of that nation shall come to take away all that may have been saved; and the expenses incurred in rescuing these unfortunate persons, shall be refunded by the nation they belong to. Whenever persons from ships of the United States come ashore in Loo-Choo, they shall be at liberty to ramble where they please, without hinderance, or having officials sent to follow them, or to spy what they do; but if they violently go into houses, or trifle with women, or force people to sell them things, or do other such like illegal acts, they shall be arrested by the local officers, but not maltreated, and shall be reported to the captain of the ship to which they belong, for punishment by him. At Tumai is a burial-ground for the citizens of the United States, where their graves and tombs shall not be molested. The government of Loo-Choo shall appoint skilful pilots, who shall be on the lookout for ships appearing off the island, and if one is seen coming toward Napa, they shall go out in good boats beyond the reefs to conduct her into a secure anchorage, for which service the captain shall pay the pilot, five dollars; and the same for going out of the harbor beyond the reefs. Whenever ships anchor at Napa, the local authorities shall furnish them with wood at the rate of three thousand six hundred copper cash per thousand catties; and with water at the rate of six hundred copper cash (forty-three cents) for one thousand catties, or six barrels full, each containing thirty American gallons. Signed in the English and Chinese languages by Commodore Matthew C. Perry, Commander-in-chief of the United States Naval Forces in the East India, China, and Japan seas, and special envoy to Japan, for the United States; and by Sho Fu-fing, Superintendent of affairs (Tsu-li-kwan) in Loo-Choo, and Ba Rio-si, Treasurer of Loo-Choo at Shui, for the Government of Loo-Choo; and copies exchanged this 11th day of July, 1854, or the reign Hieng-fung, 4th year, 6th moon, 17th day, at the TownHall of Napa. One large howitzer from the Mississippi. One large howitzer from the Powhatan. Twenty-four marines from the Mississippi. Twenty-four marines from the Powhatan. Band of music from the Mississippi. and their crews armed with cutlasses. The marines with muskets and twenty-four rounds of ball-cartridges. The seamen to be dressed in white with straw hats. The marines in fatigue summer-dress. The officers in white pants, frock-coats, swords, epaulettes, and caps. A flag-bearer and two seamen as a guard for the ensign. This entry was posted in History, Images, International, Politics. Bookmark the permalink.